What exactly is asset management? The term can be broadly used. If one speaks only of securities trading, it includes the settlement and administration of the securities or one can also understand asset management as the accounting of securities, either in the context of a subsidiary ledger with a company (e.g. insurance) or the fund accounting of a capital management company, as well as the different reporting requirements, which result from the legal form of the asset manager. Anadeo understands asset management as a front-to-back requirement. This means from the analysis of the selection of the securities to be invested in, to the preparation of the annual financial statements and the associated reports, and thus all process steps that an asset manager goes through in the day-to-day business. As part of numerous implementation and optimisation projects, Anadeo Consulting supports its customers along all processes front to back in planning and implementation in order to implement their strategic and tactical decisions operationally. Accordingly, a project in asset management for Anadeo includes the view and implementation of the requirements across the entire operational process chain, no matter which operational or technical strategy the customer has or chooses on an organisational basis. 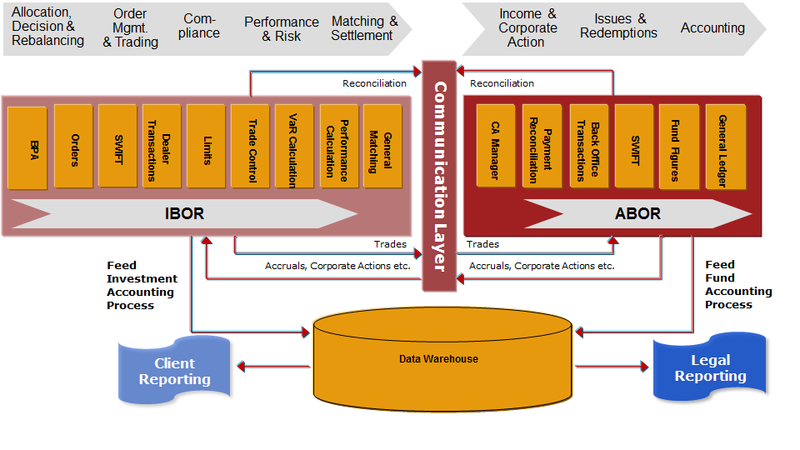 Whether it is an IBOR / ABOR architecture (investment book of records and accounting book of records), a best-of-breed solution or a wall-to-wall solution within the organisation of the company, as shown in the following images. 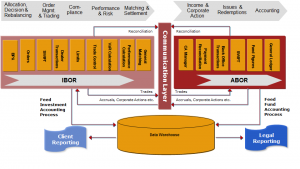 It is part of the Anadeo approach that the communication with market participants and partners of the respective asset manager (custodian bank, advisory partner, outsourcing partner for certain functions along the value chain) and corresponding interfaces in each of the individual areas is taken into account during implementation and optimisation. This is very helpful particularly in the implementation of new and innovative financial products because Anadeo is able to serve its customers here front to back and different specialists from different consulting firms are not needed in the individual areas.